Scheduled Flights To Cuba Approved For As Early As This Fall : The Two-Way The Department of Transportation has authorized six U.S. airlines to schedule round-trip flights from the U.S to some cities in Cuba. The DOT has not yet approved any flights to Havana. 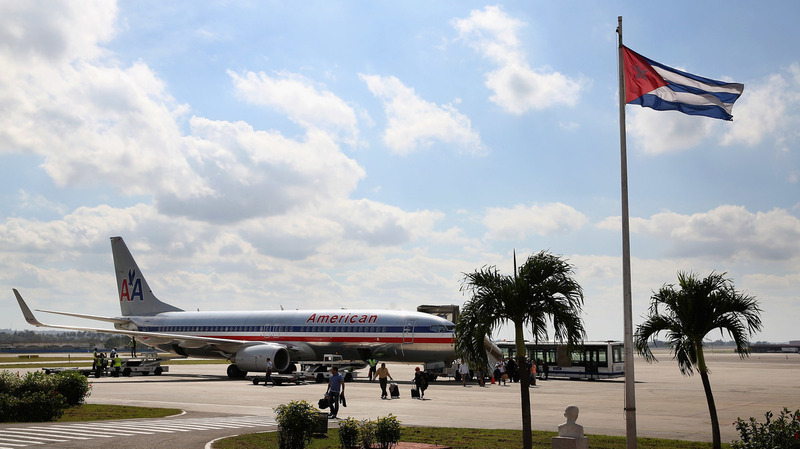 Passengers walk across the tarmac at Jose Marti International Airport after arriving on a charter plane operated by American Airlines January 19, 2015, in Havana, Cuba. The Department of Transportation has approved scheduled flights from the U.S. to Cuba, including some operated by American — though no flights to Havana have yet been authorized. The flights are possible thanks to an agreement between the U.S. and Cuba, announced in December, which allows up to 110 daily flights from U.S. cities to Cuban cities. The return of scheduled flights between the countries is a step in the ongoing thawing of relations; for decades, only charter flights were allowed to travel between the two nations. The approved passenger flights announced Friday do not include any flights to Havana. Instead, they are flights to nine other cities, with up to 10 flights per city per day. Some airlines will be authorized to fly to Havana "sometime this summer," the DOT says, with up to 20 flights per day permitted. "Last year, President Obama announced that it was time to 'begin a new journey' with the Cuban people," U.S. Transportation Secretary Anthony Foxx said in a statement. "Today, we are delivering on his promise by re-launching scheduled air service to Cuba after more than half a century." The availability of scheduled flights does not meant that tourist travel to Cuba is permitted, the DOT notes. Travelers must still prove their travel falls within an approved category, like journalistic activities, religious work, humanitarian projects or education. Flights will depart from Miami, Chicago, Ft. Lauderdale, Philadelphia, and Minneapolis. The destinations in Cuba are Camagüey, Cayo Coco, Cayo Largo del Sur, Cienfuegos, Holguin, Manzanillo, Santa Clara, Santiago de Cuba and Matanzas. The DOT has published a full rundown of which routes have been approved.